Dr. Esther M Friesner taught Spanish at Yale before becoming a full-time author. Besides the fantasy novels listed here, she writes science fiction and has published dozens of short stories. Here’s her website. Princesses of Myth — (2007-2014) These are duologies about historical princesses. 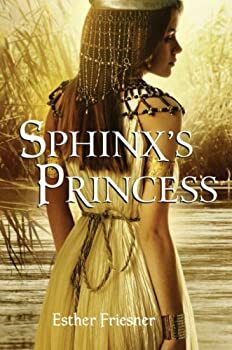 Publisher: Readers who love strong girl-centric adventures are eating up Esther Friesner’s Princesses of Myth books, finding the mash-up of historical fiction and fantasy adventure irresistible! 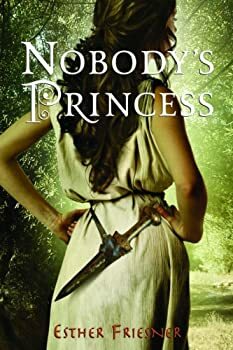 Nobody’s Princess is the story of Helen of Troy as a young woman. Because the world knows who she is as an adult, but there is no record of her childhood, Esther Freisner presents us with a determined, independent woman who wants to learn how to fight like her older brothers and go on adventures and see the world. The story kind of meanders along following Helen’s realization that she is beautiful and her decision that she wants to be more than just a pretty face. She learns how to fight with a sword and bow and arrow, and later to ride a horse. Nefertiti has had a wonderful childhood, living with her adoring father, stepmother, and half sister. She is the beauty of her small country town on the Nile River, and has the gift of dance as well as a desire to learn to do something almost no women can do — write and read. But Nefertiti’s life takes a sharp curve when her aunt, the great Pharaoh’s wife, decides that she is beautiful enough to wed to her son Thutmose, the crown prince of Egypt. Before she knows it, Nefertiti is torn from her home and family and living in the royal palace as a princess. Thutmose is not as nice as he has been made out to be by her aunt, however, and Nefertiti soon finds herself in the middle of a plot that involves Thutmose gaining power, and that could endanger her own life and the lives of the ones she loves. Chronicles of the Twelve Kingdoms — (1985-1989) These books can be read in any order. Publisher: A hero and his courageous companion embark on a fabulous quest to the realms of magic. New York by Knight — (1986-1989) Publisher: Dragon and Knight: they’d battle to the death — with New York City the final prize! Demons — (1988-1990) Publisher: A bawdy fantasy spoof featuring a group of misfit demons who have been banished from Hell. They end up in an African desert where they meet a group of American kids on an archaeological dig. But what these kids do not know about the seven deadly sins is an eye-opener to the demons. Gnome Man’s Land (Tim Desmond) — (1991-1992) Publisher: They’ll take Manhattan, and Brooklyn, too. Majyk — (1993-1994) Publisher: Kendar, the worst student magician on the world of Orbix, begins a calamitous chain of events when he chases an Earth cat named Scandal into a cloud. Kendar emerges with the biggest supply of “majyk” on the planet, and suddenly he’s being chased by a wizard, a barbarian, and a demon. The Psalms of Herod & The Sword of Mary — (1995-1996) Publisher: The harrowing journey of Becca of Wiserways Stead. 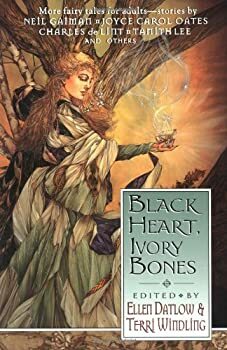 Escaping her oppressive, rural stead, Becca journeys toward the magical city where her brother lives, certain that his knowledge will save her and her kin. But after finally arriving there, she is overwhelmed by the strange ways of the Coop citizens. She soon learns that everyone, including her brother, has ulterior motives. Supernatural Suburbia — (2009) Edited by Esther Friesner. Publisher: Move over, urban fantasy — here comes suburban fantasy. What self-respecting witch, vampire, or werewolf would be caught dead — or undead — anywhere but the Big City, you may ask? Look, let’s give the uncanny crew a little credit for intelligence: If they had the smarts to see the advantage in packing up and moving into the cities, why wouldn’t they have the smarts to move out of said cities if it looked like they could get a better quality-of-life/death elsewhere? (Tough enough going about your otherworldly business and evading the occasional mob wielding halogen torches and designer pitchforks, but have you ever seen city real estate prices?) So let’s welcome our first group of supernatural suburbanites, the witches. Their powers are awesome, their methods of coping with the lumps, bumps, and idiosyncrasies of Suburbia are ingenious, and they always bring the loveliest gingerbread to the PTA bake sale. But whatever you do, don’t try telling them that life in a non-city setting is bland, banal and boring, or you might get turned into … ribbit! 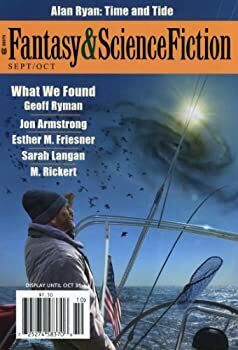 Stories of suburban sorcery by Harry Turtledove, Sarah A. Hoyt, Jan and S.M. Stirling, K. D. Wentworth, and more — including Esther Friesner herself. Harlot’s Ruse — (1986) Publisher: Pirates and princes, wizards and warriors, demons and dragons — could Megan’s magic match them all? The Silver Mountain — (1986) Publisher: He woke to death and darkness, unable to recall who or where he was. Around him, unknown comrades lay slain by dragon wrath, while he alone survived to flee these caverns of doom in search of his own identity. But in the world above lurked danger and destiny. For there a wizard would gift him with a name — Prince Dammon. Now the mortal warrior must ride to Silver Mountain. Druid’s Blood — (1988) Publisher: Can a magic-less sleuth save Victoria’s spell-beset England? Yesterday We Saw Mermaids — (1992) Publisher: Magic and Columbus clash in the New World. In 1492, as the flames of the Inquisition scorch the soul, and three ships set sail under the Spanish flag, a boatload of nuns transported by an unruly genie discover a new world unlike any other: the magical kingdom of Prestor John. The Wishing Season — (1993) Publisher: Before graduating from magic school, Khalid, a young genie, is allowed to inhabit his first lamp, but he forgets to restrict his master to three wishes and needs a princess and the help of Boabdil, his master’s cat, to save him from a lifetime of servitude. The Sherwood Game — (1994) Publisher: Carl Sherwood, a computer whiz who lives in a dream world to escape his geekiness, becomes more and more wrapped up in the new Virtual Reality program that he is designing, until the Reality starts becoming more than Virtual. Child of the Eagle — (1996) Historical fantasy. Publisher: On the eve of the conspirators’ plan to assassinate Caesar, Marcus Brutus is surprised in his garden by a vision of a woman so exquisitely lovely that he is immediately enchanted by her. She seduces him with ease, then persuades him to save Ceasar’s life instead of taking it. She only prevails by showing him visions of what Rome will be like with Caesar dead. CLICK HERE FOR MORE TITLES BY ESTHER FRIESNER.